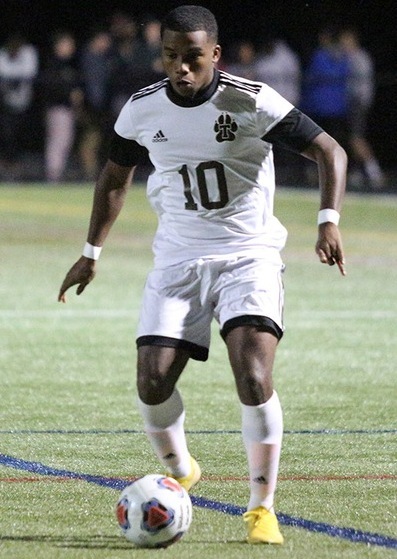 Justin Bell scored a goal and an assist to lead the Thomas College Men's Soccer team to a 2-0 North Atlantic Conference (NAC) victory over UMaine-Farmington. Thomas College Men’s Soccer feature 7 Bermuda players on their roster that includes MacQuille Walker, Bell, Jahzardae Samuels, Jahkeylo Burgess, Zenawi Bowen, Jaavaid Warren-Smith and Darin Woolridge. Bell scored his goal in the final minutes of the first half, putting Thomas up 1-0 in the 43rd minute to hold the lead going into the break. Bell assisted Josh Morrissey's insurance goal in the 82nd minute to give Thomas the 2-0 win. Jonathan Dutka stopped all three shots he faced for the shutout victory. Matthew Wilson was given the loss for Farmington after giving up two goals on six shots. The North Atlantic Conference (NAC) has announced its weekly awards for Men's Soccer and Thomas College freshman Bell has been named Rookie of the Week.